I put these as a side dish for my Grandma's Tomato Soup Meatloaf Recipe, and I just didn't like the way the potatoes looked on the cookie sheet, so I never used the photos to make the recipe until now. It took me a while to rephotograph the steps and finished product to a level I was happy with. We like ours really crispy, and they tend to look a little overly browned in pictures which isn't very appetizing. Kind of hard to promote a recipe that doesn't look very good to eat! Trust me, this is amazing, and your family will love it! This round of photos was done on mini yukon gold potatoes, while in the meatloaf recipe image they are redskin potatoes. Either kind works, and they are equally delicious. You can switch out different cheeses, too, or use fresh garlic instead of the garlic salt. 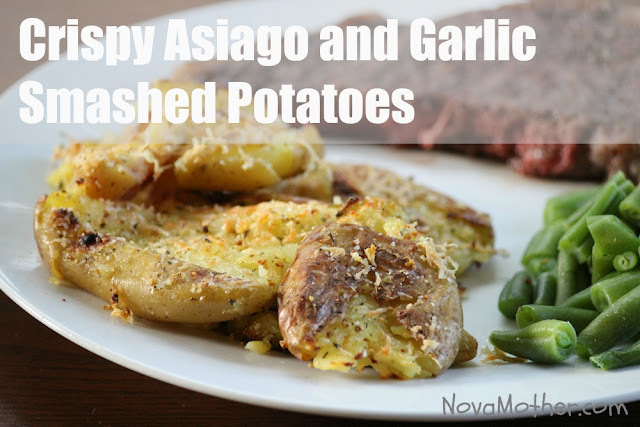 The recipe is really more about the method of cooking the potato rather than the exact flavoring, although the garlic salt and Asiago is my preferred combination. These would also be great plain with a dollop of sour cream and some bacon bits sprinkled on top. Step 1: Bring pot of water to a boil and add butter and salt. Add potatoes and boil for 15 minutes. Step 2: Drain potatoes. Toss in 1 tbs of olive oil and spread on cookie sheet. Step 3: Smash flat with the bottom of a cup. Step 4: Drizzle with remaining olive oil then sprinkle with garlic salt and Asiago cheese. Step 5: Bake 15 minutes on the bottom rack at 500 degrees Farenheit. Step 6: Switch to top rack and bake another 15 minutes until golden brown and edges are crispy. This has been my favorite potato recipe I've found on Pinterest yet, and I enjoyed adding the garlic salt and Asiago cheese to give it a bit more flavor. Boiling the potatoes so they are soft then smashing them down with the bottom of a cup gives them the perfect texture and crisp! The first time I made these, my husband practically asked me to marry him all over again. My kids really love them, too, which of course is one of the best parts about this recipe. My six year old is picky about potatoes, so I'm glad I found a method of cooking them he'll enjoy. He doesn't even eat french fries! These are also healthy, because they are baked instead of fried but still satisfy the crispy crunchy factor. Thanks so much for reading! Don't forget to PIN this recipe for future reference and of course check out more of my delicious recipes and crafts on the blog. See you next time! **Disclaimer: This article contains some affiliate links provided through Viglink.com and Amazon.com. All the opinions expressed in this article are my own. Any items featured were purchased with my own money. For more information on my policies, please view my Let's Chat page. I'm a working mother of two boys, married to a man with more patience than any one person should posess.